Objective: To benefit from the experience of singing in a musical group of your level and style while developing valuable and versatile vocal skills. Children’s as well as adult groups will be available. R&B Group: R&B, Pop, Rock-Teen favourite! Montreal Academy of Music Vocal Group: All Styles. All Ages. 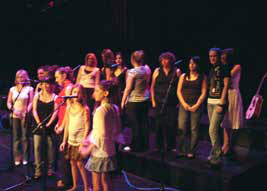 Lesson Activity: Performing in a wide variety of musical styles. We focus on vocal harmony, range, breathing and proper vocal support within a group setting. These classes have become a source of motivation and inspiration for everyone! Concerts at special events and at our Student Concerts series. Please note that all ensemble(group) courses are available upon sufficient registration.